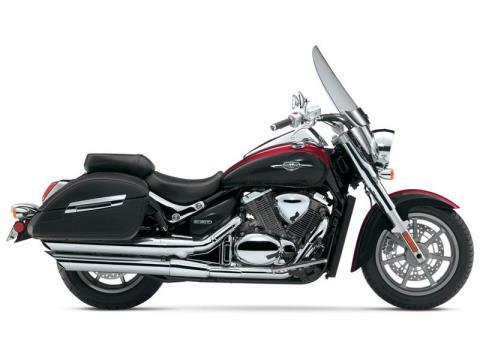 The All-New Suzuki Boulevard C90 cruiser delivers a new level of performance. With its 1,462 cc long-stroke, liquid-cooled, 54-degree V-twin engine, the Boulevard C90 cranks out monstrous amounts of torque, especially in low-mid range gears. The Boulevard C90T is equally at home on the wide-open highway. That's where you can kick back and enjoy its wonderfully spacious riding position, which lets you and your passenger stretch out and ride in comfort all day long. More power and torque means smooth acceleration essential for highway cruising. And strong power in the low and mid-range enables effortless riding through city streets. With its bold yet classic styling, the C90T features fully integrated hard side cases and a comfortable passenger seat all behind a large windscreen to deliver the complete touring experience. This is one classic cruiser that's bound to capture attention, whether you're cruising down the boulevard or kicking back at a rest stop. The Boulevard C90T - where classic cruiser styling meets excellent performance. Easy to see atop the fuel tank, the C90T features a multi-function instrument package highlighted by a large analog speedometer. The package includes a convenient gear-position indicator and a fuel gauge, along with a clock and a trip meter, plus indicator lights for low fuel, turn signals and more. It delivers a level of instrumentation that is not often found on classically style cruisers. Design engineers married the desire for time-honored appeal with the need for modern performance. The result is a traditionally styled cruiser featuring a rider triangle – footboards, handlebars, seat position – that delivers classic control with outstanding comfort. Wide handlebar and seat design, plus wide / low fuel tank shape add to C90T's low-slung look. The 1,462 cc (90 cubic inch) long-stroke, liquid cooled, SOHC, four-valves-per-cylinder, 54 degree V-Twin engine is built to deliver massive torque while maintaining efficient operation. Suzuki Dual Throttle Valve (SDTV) induction system is enhanced by the 32-bit engine control unit that instantly delivers the optimum fuel-air mixture and power output. The system – it’s the same design used in Suzuki championship-winning GSX-R sportbikes – delivers seamless throttle response while boosting fuel efficiency and delivering strong torque. To maximize air induction for best power and torque, the C90T features a unique system that uses three separate air-cleaner boxes feeding the engine. This air induction system increases engine output without sacrificing style or fuel-tank capacity. The C90T is the first Suzuki Boulevard to come from the factory with hard side cases. Hard saddlebags are made of durable, impact-resistant ABS plastic under stylish covers custom-matched to the seats. They’re designed as part of the bike, not as luggage add-ons. The Suzuki Clutch Assist System (SCAS) reduces the force needed to pull in the clutch lever so clutch operation remains light. The system produces smooth downshifts by reducing pressure on the clutch plates under deceleration.